ALOUD vs ALLOWED: which is which? Tips and tricks to remember the difference. ALOUD and ALLOWED are easy to confuse. The fact that the two words sound the same – they’re homophones – means people commonly mix them up. 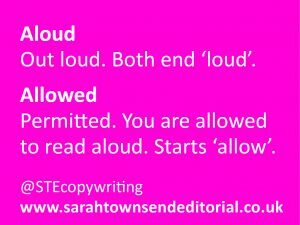 Here are my simple tips to remember the difference between ALOUD and ALLOWED. ALOUD means out loud. Remember that this spelling ends in LOUD. ALLOWED means permitted. Remember it starts with ALLOW. In its verb form, ALLOWED is that past tense of ALLOW.